You just got a wedding invitation in the mail. Luckily, you should have about three to six months to decide what to wear. However, shopping for the perfect dress for a wedding can be extremely difficult, and will most likely take a good chunk of time. Once you get that invitation, start shopping immediately, and keep the following tips in mind. Most often, weddings will have a requirement of formal attire. Black-tie events will require the girls to be in evening gowns or cocktail dresses. Do not make the dress too short: always keep in mind that a wedding is a classy event in most occasions. A dress you would wear to a club is most likely not the dress you should wear to a wedding. Colors are also very important. Girls: never, I repeat, never wear a white dress to a wedding. It's just not proper etiquette to compete with the bride on her very special day. Guys, for formal weddings you're going to have to wear a suit. A dark suit is usually better, and a modest tie is usually the proper way to go. If the wedding invitation specifies it's a black-tie event occurring in the evening, you should rent a tuxedo to be a little more classy. What if the wedding you're invited to is informal? In this instance, you don't want to show up wearing a fancy evening gown or a tuxedo. Instead, the girls should purchase a shorter dress (as long as it's appropriate), in any number of colors, except white. Guys, you might want to wear a suit, but sometimes a shirt and jacket are perfectly fine. 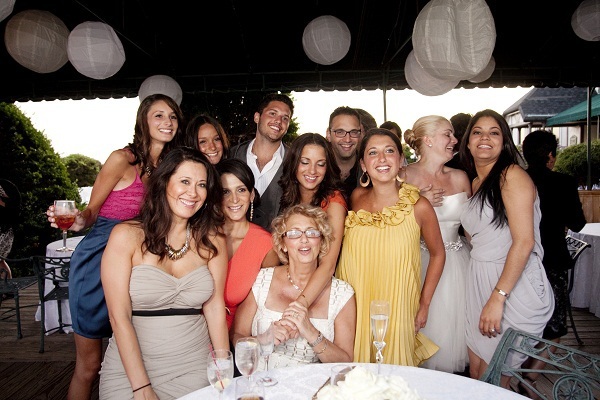 For informal weddings, try getting in touch with one of the bridal party for suggestions. Informal does not mean jeans and a t-shirt, so never take that route. Theme weddings are much more fun to dress for, and oftentimes you have a lot more leeway when it comes to your outfit. Some examples include renaissance themes, where everyone dresses in outfits from the medieval time period, or perhaps a Mardi-Gras theme where everyone shows up with beads and masks to accessorize their suits and dresses. As a personal example, my own wedding will be a Western theme. It is an informal wedding, but guys are encouraged to show up in Western attire, and girls would do great in wearing a sundress and cowboy boots. Most likely, that invitation will not be for a theme wedding that tells you exactly how to dress. Follow the guidelines above for formal and informal weddings. Nine times out of ten, you can follow your gut on whether that dress is "dressy" enough, or whether the suit and tie will cut it. Always remember, there are ways to get in touch with others to discuss the bride and groom's decisions on attire. And, more often than not, you know someone who's been to a wedding and can tell you the ins and outs. Most importantly, do not be afraid. It's only one party that lasts one day. And everyone will be looking at the bride, anyway.